This afternoon I will be joining with many state officials and Rabbi Lieberman in the lighting of the State House Menorah. It is an impressive ceremony that features inspiring words and a program of music performed by many students. 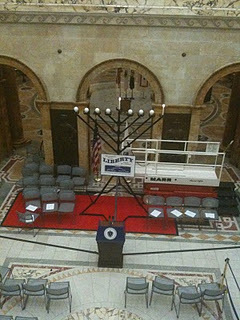 Today’s lighting of the Menorah is open to the public and will take place in Nurse’s Hall on the 2nd floor of the State House, and begins approximately at 4:00pm.